If any of you follow anything I have to say about Dook or coach k, you know that I’m not a big fan...never have been and never will be, and I’ll save my reasons for another time. Anyway…last night mike krzyzewski moved into 2nd place on the NCAA men’s college basketball all time wins list leaving behind his long time rival, Dean Smith. 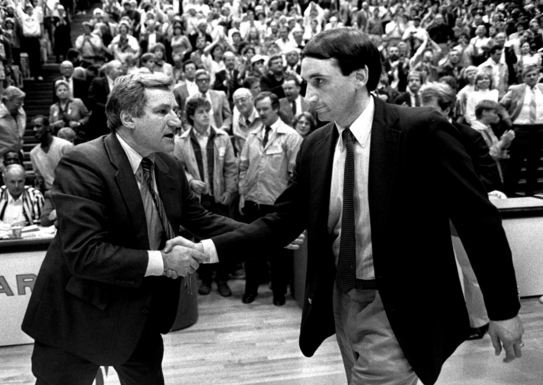 coach k has 880 wins and is now only 22 wins away from becoming #1 on the list and passing his long time mentor and former coach, Bobby Knight. However, when he does pass ol’ Bobby, he’ll only be moving into #1 in “men’s” college basketball…it is very unlikely that the 63 year old Dook coach will ever pass the 58 year old Pat Summit who is currently at 1044 wins with 8 national championships and showing no signs of retiring. Either way, coach k has passed the beloved former UNC coach and without a doubt gives all of Dook nation something to talk trash about and all of Tar Heel nation something to cry about. Piss on k!! Dean made the game of basketball what it is today.